My mother, Rita, loves her roti ﬁlled with chicken foot curry, and I like seitan or tofu. But honestly, this coconut-rich curry is delicious made with just about anything from calabaza squash to cauliﬂower, eggplant, or cabbage … or try it with goat like they make it in the Caribbean. Roti is a ﬂatbread that we stuff with cooked yellow split peas. They are griddle-cooked until both sides are blistered a little and the roti is ﬂaky and tender. Rip it up and dunk it in the curry — oh, is it good! Chef’s note: The roti can be made and rolled a day ahead of cooking, then griddled the next day. Just wrap them well in plastic so they don’t dry out. 1. Bring a medium saucepan of water to a boil over high heat. Add the split peas, reduce the heat to medium-low, and gently simmer until the split peas are tender, about 30 minutes. Drain the split peas into a ﬁne-mesh sieve. Set aside. 2. While the split peas are cooking, whisk together the ﬂour, baking powder, salt, cumin, chile powder, and turmeric in a medium bowl. Add the solid coconut oil and work it in with your ﬁngers until the dough is ﬂaky. Make a well in the center of the ﬂour mixture and add 6 tablespoons cool water. Start to work the ingredients together — after 30 seconds to 1 minute, you should be able to squeeze a small bit of dough and have it stick together without crumbling apart. If it is still too dry, add more water, 1 tablespoon at a time, until it holds together. Continue to knead the dough gently, pressing it against the sides of the bowl until it is soft and smooth, 1 to 2 minutes. Cover the dough with a damp paper towel and set aside to rest for 30 minutes. 3. Place the dough on a ﬂoured work surface. Roll it back and forth to shape it into a log about 6 inches long, then cut it crosswise into 4 equal pieces. Flour the work surface again and use a rolling pin to roll one portion into an 8-inch round about 1⁄16 inch thick, reﬂouring the dough and work surface and ﬂipping the dough over occasionally so it doesn’t stick. Brush the dough with some of the melted butter (save the remainder for cooking the roti). Sprinkle 1⁄4 cup of the cooled split peas over the dough in an even layer and use your hands to press them into the dough. Use a paring knife to make a slit in the dough from the center of the round to an edge. Lift one side, tuck the cut edge under and roll the dough around to the other side so you end up with a cone shape that is narrow at the base and wide at the top. 4. Hold the cone in one hand and use your ﬁngers to press the ragged ends into the middle of the cone, without pushing all the way through the cone (it will look something like a donut). Flip the cone over and repeat with the other side. You will end up with a fat donut-shaped piece of dough. Set the roti on a ﬂoured plate and cover with a damp paper towel. Repeat with the remaining pieces of dough and let them rest for 45 minutes. 5. Add the coconut oil and annatto seeds to a small saucepan set over medium heat. Infuse the oil, stirring often, until the oil is tinted red, 11⁄2 to 2 minutes, taking care not to let the seeds burn. Strain the oil through a ﬁne-mesh sieve and into a large pot. Discard the seeds. 6. Set the pot over medium-high heat and add the onion, garlic, and Scotch bonnet, cooking until they soften, 3 to 4 minutes. Stir in the curry powder, coriander, paprika, allspice, and salt. Once the spices are fragrant, about 30 seconds, add the coconut milk and 1⁄2 cup water. Bring the liquid to a boil over high heat, then reduce the heat to medium-low and add the CannaOil, protein or hearty vegetable, potatoes, and bell pepper. Cover the pot and simmer, stirring often so nothing sticks to the bottom, until the potatoes are tender, about 30 minutes. Taste and season with more salt if needed. Remove from the heat. 7. Place the ﬁrst piece of dough on a lightly ﬂoured work surface and slice it in half horizontally (so you have 2 circles). Flour the top of one piece and roll it into a very thin 61⁄2- to 7-inch-diameter round. Repeat with the other pieces of dough to make 8 rolled roti. 8. Heat a medium nonstick skillet over medium heat. Use a silicone or pastry brush to lightly coat the pan with some melted butter. Set one rolled dough in the skillet, and cook until the top bubbles, 1 to 2 minutes. Brush the top with melted butter. Use a spatula to ﬂip the roti over and brush the second side with melted butter. Cook until the bottom is golden with brown spots, 11⁄2 to 2 minutes total. Flip and cook the other side until it has brown spots, then transfer the roti to a large plate and cover with a towel. Repeat with the remaining dough circles. 9. Add the peas to the curry and warm the mixture over medium heat until the peas are warmed through, about 2 minutes. Serve the curry sprinkled with parsley and with the roti on the side. 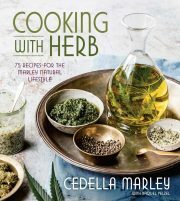 Reprinted from “Cooking with Herb” by arrangement with Pam Krauss Books/Avery, a member of Penguin Group (USA) LLC, A Penguin Random House Company. Copyright © 2017, Cedella Marley.